Hello readers, today I am back with another new recharge offer. 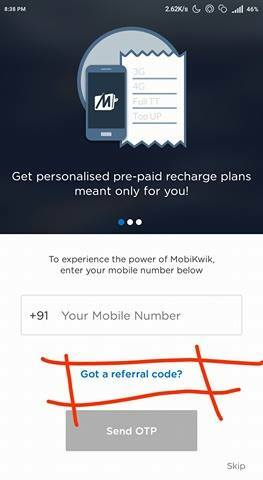 This offer is for the new user who never used mobikwik. Mobikwik is giving Rs 105 recharge at Rs 10 for new user. So hurry up and grab this deal if you wants. With MobiKwik, you enter the world of payments that happen in seconds. You can shop with MobiKwik Wallet at different online websites & now offline as well. It supports all Telecom operators like Airtel, Vodafone, BSNL, MTNL, Reliance, Idea and others. It allows you to browse through prepaid and postpaid plans for 2G Packs, 3G Packs, full talk time etc. Not just that, the new bus-ticketing feature allows you to avail the facility to book bus tickets through your app in no time at all. Travelling is now easier with bookings done beforehand. You can simply Add Money to your wallet with any Credit Card, Debit Card or Netbanking. 3. Now your are in dashboard of the mobikwik app, Now click on add money option and add Rs 10 in your wallet. 4. Apply promo code – INDIA or SUPERCASH and complete the transcation from your debit or credit card. 5. You will get Rs 65 SuperCash Instantly and Rs 40 super cash within few minutes.